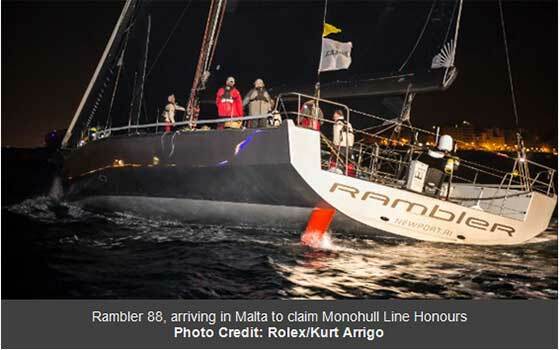 George David's American Maxi, Rambler 88, crossed the finish line of the 2015 Rolex Middle Sea Race at the Royal Malta Yacht Club to take Monohull Line Honours at 04.48.43 CET on Tuesday 20th October in an elapsed time of 2 days 16 hours 18 minutes and 43 seconds. 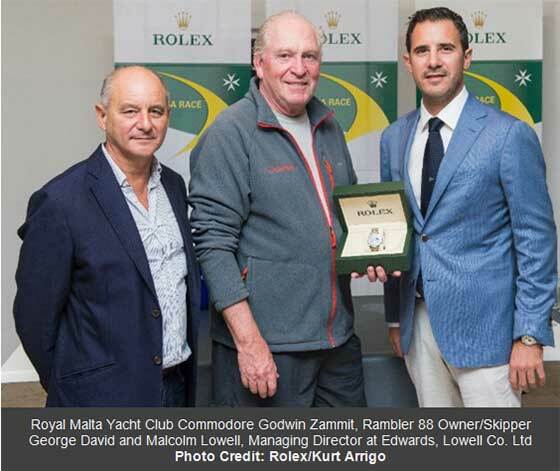 George David was greeted by Godwin Zammit, Commodore of the Royal Malta Yacht Club. 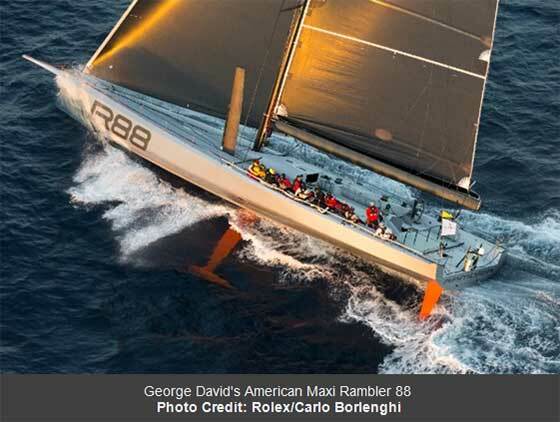 Rambler 88 is a far cry from George David's Rambler 90, which set the Rolex Middle Sea Race record in 2007 (47 hours 55 minutes and 3 seconds). Rambler 88, on the design numbers is 20% faster than Rambler 90. Rambler 88 has an enormous sail area and features five metre vertical daggerboards, as well as three metre horizontal foils, which lift the boat when sailing at top speed. The canting keel also produces significant righting moment, allowing the boat to carry a huge amount of sail area aloft and still remain in control. "We broke the record in 2007 but that has not been broken this year, so it is nice to keep that one intact." commented George David. "This was a slow race, although we did have incredibly varied conditions, we saw zero to 23 knots of wind speed and everything in between and every cardinal point of the compass for wind direction and wind transitions of up to 90 degrees. On one of those, we went from the drifter sail to the J4 heavy weather jib. In respect of the record, the first half of the race killed any chance and in the second half we had 160 miles dead up wind from Trapani to Lampedusa. This is a new boat this year and I would say we have had a very good season. Reliability has been virtually 100% and that is important in a boat like this and for this race, we have had a dry boat, which we didn't have for the Transatlantic Race; it takes a while to find all the leaks and things like that. I would say we have had the short end of the weather in our races this year, definitely in the Rolex Fastnet, although we won our class and beat Comanche, it was a small boat race with good wind coming behind for the little boats. In the Transatlantic Race, we won our class and beat Comanche but we were fourth overall and that was a function of the time of the starts. We were the last start of four, separated by a week and we didn't have the weather, we sat in a high of Newport for two and a half days. So I would say in 2015 we have not had the best of the weather but in 2007, 2008, we had the best of the weather you could possibly have, so we have had our share of great weather. So what goes down goes up and I am expecting better weather for 2016. For this race (Rolex Middle Sea Race), it is nice to have line honours but this boat was built to be good on IRC corrected time in ocean racing; that is what it was designed for and a lot of that is the function of the fleet. I would have been concerned if we had not taken line honours for this race because our allowance with the second highest rated boat, Momo, is about 15% and if we had not been ahead of them on the water, I would have been upset. The overall win under IRC is out of our hands now, it depends what happens to the breeze but I feel that there will be boats that will beat us. We carry an unusual rating penalty, which are side foils. These foils are only effective when boat speed is over 20 knots and that costs us a 2.5% rating penalty and that will probably cost us a place or two in the race but that is a call that we made."